To maximize energy during workouts, a nutritious pre-workout meal is crucial. The perfect pre-sweat session meal idea is based on your food preferences and at times, trial and error. The timing of pre-workout meals should be one to three hours before your workout -- plus a smaller snack about 20 minutes pre-workout, suggests the Academy of Nutrition and Dietetics. While you can slightly increase your meal size if you're participating in longer endurance exercise, it's best to not overdo it at mealtime and have additional snacks closer to your sweat session if need be. That way, you won't feel overly full or bloated, which can hinder performance. If your cardio session lasts more than 60 minutes, the American Academy of Sports Medicine suggests drinking a sports drink containing 5 to 8 percent carbohydrates every 15 to 20 minutes for an electrolyte and energy boost. You can also choose sports gels, dried fruits, or chews as a carb source during longer workouts. You can also use an English muffin or two slices of whole-grain bread if you don't have a bagel handy. Top 1 to 2 cups of cooked oatmeal with 1/2 to 1 cups of fresh fruit (or dried fruit), plus 1 tablespoon of nuts or seeds. Mix 1/2 cup of oatmeal into a protein smoothie (1 cup of Greek yogurt, 1 cup of plant-based milk, 1/2 cup of fruit, and 1 tablespoon of nut butter); you can use 1 to 2 tablespoons of protein powder mixed with water instead of yogurt and milk if you'd like. Try this almond blast protein & oats smoothie recipe. Quinoa is another starchy food that's loaded with fiber and protein, so you'll stay energized longer during exercise. 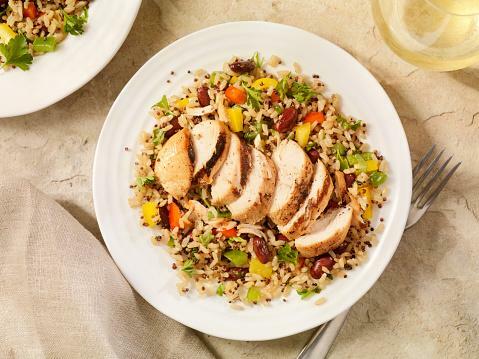 Try these quinoa pre-workout meal ideas for a sweat session you won't forget. You might have to do some trial and error when it comes to sports nutrition and pre-workout meals to see what sits the best in your stomach, especially during high-intensity training. Several hours (1 to 3 hours) before your workout, it's best to choose a healthy starch (whole grain breads, brown rice, oatmeal, whole wheat pasta, or quinoa just to name a few) coupled with some protein such as grilled chicken, turkey, eggs, fish, tofu, yogurt, cottage cheese, nuts, or nut butters. Just prior to working out (within 20 minutes), pick a carb-rich simple sugar-containing snack, such as juice, dried or fresh fruit, an energy bar, sports chews, sports gels, or an energy drink, and eat or drink simple carbs periodically during longer workouts lasting more than 60 minutes.